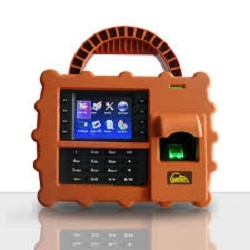 Portable Fingerprint/RFID Time Attendance System - Baztech Incorporated (Pvt) Ltd. It gets connection to the WIFI and 3G (WCDMA) network through TCP/IP, USB host and GPRS communication. Coated with a layer of rubber outside, the product is shatterproof mounted at 1m above the ground. In the design of portable case, the fingerprint or RFID time attendance system is convenient to carry. Language English, French, Spanish, Arabic and more than 40 languages can be selected.